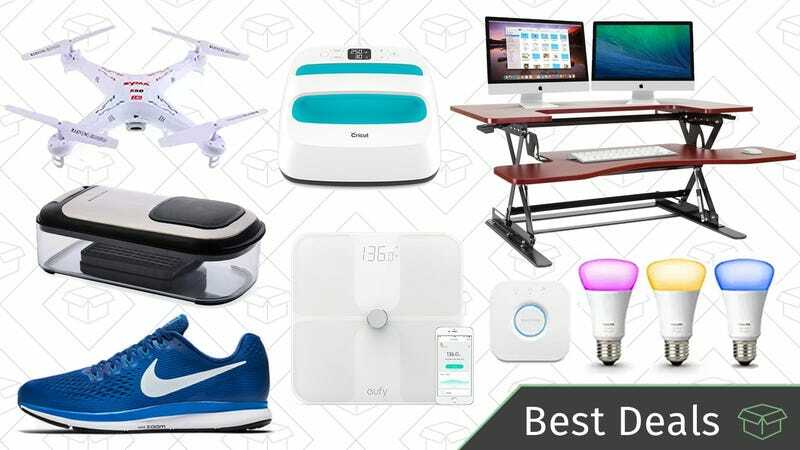 Brighten up your day with discounts on Philips Hue smart lights, an adjustable standing desk, a camera-equipped drone, and more of today’s best deals from around the web. Whether you’re just starting your Philips Hue collection, or just have a few more light fixtures that need to be upgraded, Amazon’s running an unprecedented sale on refurbished Hue lights, today only. 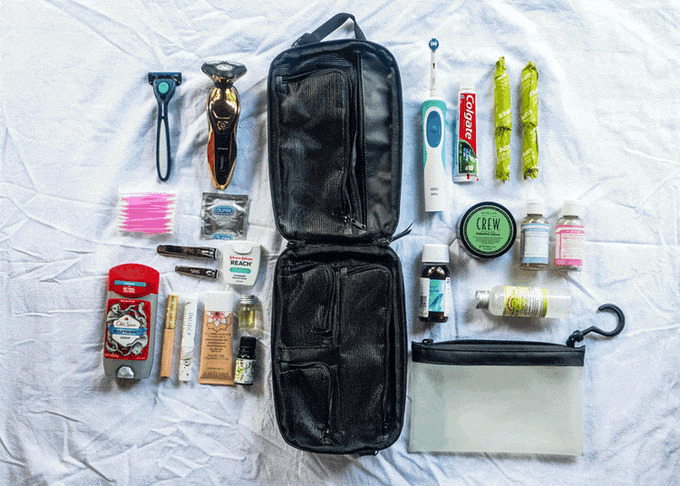 Head over to Amazon to see all the products on sale, or check out this post with our recommendations. There are precious few battery packs out there with USB-C power delivery, and this 26,500mAh model from Aukey is one of the biggest and most affordable we’ve seen. In addition to the two standard USB output ports, the USB-C port works as both an input and high-speed output port that can charge a 12" MacBook at full speed. It’s pretty huge, but 26,500mAh should be enough juice to power your devices for hours or days on end. Just be sure to use promo code FORMOMP7 at checkout to get it for $56. It’s a matter of taste, but some might say that the new, cheaper Nest Thermostat E is even nicer looking than the original, while still packing in almost all of the original model’s features. It’s a bargain at its usual $170, but today you can get it for $130 from Verizon, which is the best price we’ve seen outside of a short-lived $110 deal on Woot. LED desk lamps with USB charging ports are so 2017 - it’s all about Qi pads now. This lamp from TaoTronics has adjustable color temperature and brightness, looks great, and most importantly, has a base that doubles as a wireless charging pad for your phone. It’ll even charge an iPhone wirelessly at 7.5W, its maximum speed, and there’s also a USB charging port on the back so you can plug in a tablet as well. For all you’re getting, its regular $60 price tag is honestly pretty fair, but promo code KINJAD43 will bring that down to $45 today. If you still haven’t tried out a home theater bias light, today’s a great day to pick one up. Vansky’s LED bias light strips plug directly into your TV’s USB port for power, and stick to the back of the set via built-in adhesive. Once you turn your TV on, the LEDs cast a soft glow on the wall behind them, which can reduce eyestrain when watching in the dark, and improve your TV’s perceived black levels. This RGB strip includes a remote to change the color, and you can get it for $12 today with code YAD3U2HB. It’s designed for TVs up to 60", and if yours is smaller, you can actually cut the strip to length. Anker’s PowerPort 2 Elite is the travel-friendly version of your favorite USB charging hub, and here’s a rare chance to get it for under $10. The PowerPort 2 Elite includes folding plugs (which snap in place with a very satisfying click, for what it’s worth), 4.8A of power split between the two ports, and even a color-changing light that lets you know when your devices are finished charging. It’s certainly not what you’d consider a traditional Mother’s Day gift, but who couldn’t use a new phone case? For a limited time, Speck is taking up to 40% off select device cases, and don’t worry, they aren’t all floral-patterned. This tiny, $6 USB charger isn’t much bigger than the one that ships with every iPhone, except it has two ports, folding prongs, and 2.4A of total power, compared to the 1A Apple gives you. No surprise, it’s one of our top sellers of all time. Just use promo code FORMOM32 to get the deal. Anker has a new Qi charger out, and it’s one of the the first ones you can buy outside of an Apple Store that support 7.5W iPhone charging (only available on the iPhone X, 8, and 8 Plus), rather than just 5W. It’s marked down to $32 right now with promo code ANKER254, which is $14 less than usual, and a match for the best price we’ve ever seen. If that’s more than you want to spend, Anker’s 5W Qi stand is also on sale for $17, no code required. It won’t charge your phone as quickly, but it’ll be fine for overnight charging. Anker’s ultra-popular PowerDrive 2 Elite car charger can output 12W of power on both of its ports simultaneously, and it looks really nice to boot. Its carbon fiber finish should look right at home in your car, and its lighted USB ports make it easy to plug in a new cable in the dark. For a limited time, it’s marked down to $10 on Amazon, or $2 less than usual. Amazon’s Mother’s Day device deals just went live, with big savings available on Echoes, Kindles, Fire tablets, and more. So if Mom’s had a new Kindle on her list, or if you want to get her an Echo Dot or Echo Show to video chat with the grandkids, now’s the time to buy. Some of the deals, like the Echo Dot, have additional savings available at checkout if you buy two as well. Head over to this post to see all the options. Anker’s SoundBuds Slims are our readers’ favorite affordable Bluetooth headphones, and you can grab a pair for just $20, or about $6 less than usual. I’m sure we’ll get some commenters on this post (I cordially invite you to not be that person, but whatever, live your life) that say “just use a knife to cut your fruits and vegetables.” And yes, I’m aware that you can, in fact, use a knife to cut fruits and vegetables. But for anyone who wants to spend as little time cooking as possible, the KitchenAid Gourmet 3-in-1 Chop & Slice lets you dice and slice entire veggies with just one firm press of your palm. It’s dishwasher safe to boot, and it’s never been cheaper than it is today. Want to screen print t-shirts, kids’ soccer jerseys, or other arts and crafts at home? The Cricut Easy Press offers a giant heating pad that makes the process way simpler than an iron. It rarely sells for under $130, and has never been below $120 on Amazon, but today, you can grab it for $106. Even if they use exactly the same ingredients, panini-style sandwiches are infinitely better than boring, cold sandwiches. If you’d like to make better sandwiches, pick up this discounted Calphalon nonstick panini pan and press. Is it an essential kitchen item? Probably not. But today’s price of $40 is the lowest it’s been all year, so it’s a good day to splurge a little. Let the power of steam clean your bathroom and kitchen with this Bissell steam shot hard-surface cleaner. It’s designed to get dirt out of tile grout and soap scum out of showers and tubs. It even comes with seven attachments to help you clean hard-to-reach places, like all the nooks and crannies around your stove and sinks. $30 matches this machine’s all-time-low price, so you might as well get it while it’s hot. So you want to try a standing desk in 2018, but you’re not ready to commit to it for eight hours a day...what do you do? You buy a discounted monitor riser, and sit or stand whenever you feel like it. Just don’t be too smug about it. The ED-258 has enough space on top for two large monitors, and an oversized keyboard and mouse area too, so you can fit even the most obnoxiously large mechanical keyboard. $160 is the best price we’ve seen, and $40 less than the last time we posted it, but it’s only available today. Update: This deal is back, if you missed it last week. You might not have an immediate need for a pressure washer, but if you own a home, it’s a useful thing to stash in the back or your garage. For a limited time, Amazon’s marked down a popular GreenWorks washer down to $91, which isn’t an all-time low, but it’s about as good as it gets outside of special events like Gold Boxes. Just be sure to get yours before this deal is blasted away. For between $33 and $35, you’ll get a My Pillow in the sizes of your choice, with either medium or firm fill. These aren’t exactly the same as the pillows that won our Co-op—they’re gusseted, meaning there’s a piece of fabric stretching around the edge of the pillow, rather than the top and bottom being sewn into each other—but the patented fill is the same. Use promo code OHUHU32O at checkout to save. One of the easiest home upgrades you can make is replacing that crappy shower head that came with your house or apartment. This Delta two-in-one was ranked as your absolute favorite, and is down to just $80 today, a new all-time-low price. I bought this exact shower head last year, and it’s been worth every penny. You (probably) shower everyday, might as well make it as enjoyable as possible. If you haven’t bought one of our readers’ favorite meat thermometer, the Thermapen yet, today is good day to change that. And while you’re over there, you might as well fill your cart with a bunch of other ThermoWorks stuff because everything is 15% off. You can pick up a smaller probe thermometer, a thermometer specially designed for meat smokers, this extra big, extra loud timer, or a whole bunch of highly-rated kitchen gadgets for the foodies in your life. Why are they hosting something called the “Start of Spring sale” in May, essentially the summer? I have no clue. They’re thermometer makers, not meteorologists. You won’t have to deal with messy cooking spray or scrubbing your cookie sheets when you use these silicone baking mats. They essentially provide a nonstick, easy-to-clean layer between your food and your cookie sheet. A three pack is just $13 (with code KDUGM4K2), and these will keep you cookie sheets looking new for a very long time. Give a Larabars a try with this variety box, just $19 after the $5 off coupon. If you’re unfamiliar with Larabars, they’re gluten-free, soy-free, dairy-free, vegan bars, mostly made from dates. This brand has a bunch of interesting flavors (blueberry muffin is my personal favorite) and this variety box is a good option if you aren’t ready to commit to a big box of one flavor. As always, you can save a little more when you Subscribe & Save, just remember to cancel your next shipment after your first order ships. The six quart Instant Pot Ultra is no longer $50 off, but if you were holding out for a deal on the family-sized eight quart model, Amazon just rolled out a $20 clippable coupon. The Instant Pot Ultra features a completely revamped, dial-based UI that makes fine-tuned adjustments faster and easier than the older models. A new processor allows it to compensate for altitude and carry out completely custom programs, and it also has a few modes you won’t find on the standard Instant Pots, like cake, eggs, and sterilize. Obviously, this isn’t quite as good a deal as we saw earlier this week on the smaller version, but $160 is a match for the best price we’ve seen on the supersized model. This is where you put your laundry. See, it’s written right there on the side. $13 is within a a few cents of an all-time low price, so you’ll have more money left over to spend on detergent. You know, to do the laundry in your clearly labeled laundry bag. If you’ve watched daytime TV in the last few months, you’ve seen Gotham Steel pans. Now, you can try one out yourself for just $10. Despite the fact that it has the word “steel” in the name, the cooking surface is actually a nonstick ceramic, which won’t be as prone to flaking as teflon, can stand up to sustained 500 degree temperatures in the oven, and is also dishwasher safe. Anker’s Roav dash cam has been a hit with our readers, but today you can save big on the newer Pro model. Everything covered in our review of the original still applies here, but the Pro upgrades the resolution from 1080p to 2560x1440, and bundles in a 32GB microSD card so you don’t have to provide your own. Just think, your crazy dash cam footage could be the next to be featured on Jalopnik. We post deals on aromatherapy diffusers pretty often, but they usually don’t look this cool. This TaoTronics diffuser comes with two glass covers (one silver and one dark blue) and displays a mesmerizing 7-color light show. It’s also bigger than the typical diffuser, with a 200ml tank which equals out to about 20 hours of misting. Today, it will cost you just $30 when you enter promo code KINJACDW. Throw in this set of essential oils, and you’ll be all set. Keep all your leftovers in these airtight, leak-proof containers for less than ever today. All 9 containers with lids will set you back only $15, down the usual $20, and you can feel free to throw them in the microwave and dishwasher. Anker makes smart plugs now, because Anker makes everything, and the compact model is down to an all-time low $18 today with promo code DGY8TLE6, while supplies last. Like pretty much all of these things, you can control or schedule the Eufy Smart Plug Mini with both your phone and with Alexa, and its built-in energy monitoring feature is a great inclusion at this price. Plus, its slim design means it won’t block the other outlet on a receptacle, so you can plug something else in (including a second smart plug). You’ve got two choices today: a plain white smart bulb, or a full RGB model. Either way, you can control and dim it from your phone, or with an Alexa or Google Assistant device, no hub required. Just be sure to note the promo codes in the photo caption. I don’t know if science can explain it, but the pan I need for cooking is always the pan on the bottom of the heavy stack in my kitchen cabinet. It’s not the biggest inconvenience, to be sure, but this $20 rack would definitely make things just a little bit easier. Just be sure to clip the $5 coupon to get the deal at checkout. If you missed it during its brief window of availability last month, Amazon’s snack sample box up for order, and it’s basically free. Iced coffee is a brilliant way to sell people ice for the price of coffee (which is mostly water to begin with). Cold brew on the other hand is a different process that results in less acidity, among other benefits, and you can do it yourself at home with this top-selling Takeya, now down to $18 on Amazon. Amazon’s listed slightly lower prices on a few occasions, but $18 is the best we’ve seen in several months, and ‘tis the season for cold coffee. It’s the perfect time to plan for a a big run (or finish off training for an upcoming race). Nike has the perfect sale for those of us that need to update their workout wardrobe, because god knows how long you’ve had those leggings or basketball shorts for. For the next few days, they’re taking an extra 20% off almost 4,000 sale styles for men, women, and kids. Everything from running tights to sneakers to sports bras is included. Note: It looks like there’s a lot of exclusions, but the code does work on things. I promise. I have painful, yet fond memories of my college’s Athletic Trainer using one of these on my thigh after I suffered a strained quad. They are hell while using it, but heaven afterwards. And for $6 when you use the code ALPUMGGO, this muscle roller can help further your love-hate relationship with working out. If you want to keep track of your summer weight loss goals, Anker’s ultra-popular Bluetooth smart scale is back on sale today. In addition to functioning as a normal digital bathroom scale, the Eufy BodySense can measure metrics such as body fat percentage and body water, and sync all of that data over Bluetooth to your iOS or Android smartphone. You can see my impressions here, but it’s the most seamless and reliable smart scale I’ve ever personally used, and a great deal at $35, one of the best prices we’ve seen. It’s Friday afternoon, things are kind of slow, and Erica and Jillian refused to post these products, so here I am. Obviously, you don’t have to buy both the kangaroo mask and the LED eyelashes, but after mashing them up in the image above, I really think you should. If you’re running low on contacts, or just want to stock up before your prescription expires, you can get 25% off the brand of your choice from Walgreens with promo code VALPAK1. You never want to be in a situation where you need a solar and hand crank-powered weather radio with a flashlight and USB charging port for your phone, but when you can get one for $15, you probably should buy it just in case. Just use promo code VKGAODFL to save. The Philips Sonicare AirFloss is a better way to clean between your teeth, and (hopefully) one you’re less likely to forget about. Just fill it with water or mouthwash, position the tip between your teeth, and hit a button, and between 1-3 high pressure bursts will rinse out all of the grime between your teeth, no floss required. For a limited time, Amazon’s offering it for $40 when you clip the $5 coupon, which is the best price we’ve seen in months. So go order yours now, and impress your dentist at your next appointment. Newbury Mills Shirts, 3 for $99 with promo code kinja330. All additional shirts $33 each. Newbury Mills has quickly become one of our favorite shirt makers, with offerings that can be dressed up or down, worn tucked or untucked, and with or without a tie. They also resist wrinkles well and are 100% soft SUPIMA cotton. Our readers can grab three for $99, plus additional shirts for $33 each. Considering one shirt is normally priced over $80, this is a great opportunity to upgrade your entire wardrobe. Just be sure to add at least three to your cart (you can mix and match styles), and use promo code kinja330 at checkout to get the deal. Soak up some savings on this 12-count set of bath bombs on Amazon today. They’re scented with essential oils, like jasmine, tea tree, and rose, and they would make a great gift. Just to be sure to enter promo code YG5QMX7F at checkout to bring the price down to $13. If you’re planning to see the new Deadpool movie in theaters anyway, this deal requires minimum effort. All you have to do is buy a select X-Men digital film or TV season on Amazon, and you’ll get an $8 Fandango credit that you can use on a Deadpool 2 ticket. Eligible titles start at $8 (Elektra), making them basically free with this promotion, but most (including the first Deadpool) are available for $10. Logan is probably your best movie bet at $11, or you can own and binge the first season of Legion for $9. Need to pass the time until Deadpool 2 comes out in theaters? ComiXology is running a huge sale on digital Deadpool comics, including hundreds of single issues for $1 each, plus a bunch of collections for $3-$5. If you’ve caught drone fever, but don’t have hundreds of dollars to spend on a DJI Phantom, Amazon will sell you a basic camera-equipped quadcopter today for just $24. It should go without saying that this isn’t a professional tool by any means. The camera only shoots 720p, and the results look like something that might have come out of a 2009-era smartphone (here’s a sample video). But hey, it’s a camera in the sky for under $25, who can complain? I don’t care how old you are; mini basketball hoops are irresistible fun, and this highly rated, glow-in-the-dark model from SKLZ is just $20 right now on Amazon, within a few cents of an all-time low. Now if you’ll excuse me, I’m gonna go put this one over my door so I can feel like I’m Boban Marjanovic. Clear off some table space and build these two architectural feats brick by brick. Both the Eiffel Tower and the Chicago Skyline are at their best prices in six months, just $29 and $32 respectively. The days of $40 PlayStation Plus sales are mostly behind us, so if your membership is set to expire soon, you may want to pick up another year for $48, or 20% below retail. While we’ve seen better deals on a lot of these games as physical copies, Amazon’s limited-time digital sale event is still worth a look for any Xbox One owner, especially if you prefer to download games. You can see all of the deals here, but a few of our favorites are in this post. Be sure to drop your own recommendations in the comments too.